Last week, I had the exciting opportunity to go spend a quick 48hrs in Hautes-Gorges National park alongside other incredible photographers documenting the park during it’s first winter season. 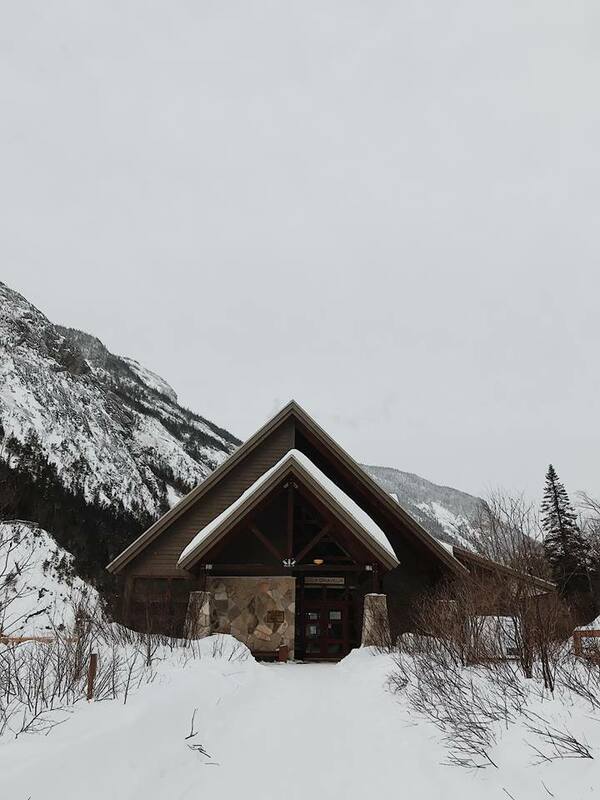 Hautes-Gorges is a spectacular park in Charlevoix region, and it was the first time of the year that they open during the winter months, offering a bunch of fun activities and incredible hikes to enjoy winter at its fullest. Knowing me and my anxiety, I left extra early in the morning to make sure to not get stuck in traffic, but also due to the fact that I couldn’t sleep and was waiting for my alarm to go off and say it’s time to go! After a 6 and a half hour drive, I finally made it to the park. I always enjoy the drives, especially this one. Leading up to the park, you cross some insane landscapes as you watch the mountains get closer and closer. It’s also really cool to discover the difference in landscapes from one region to another. Having gone to Grands-Jardins in the fall, I noticed the ressemblances of nature that made me think of a mix of the arctic - boreal forests. Arriving at the Draveur lodge (the main lodge) I started to familiarize with the staff, look at the hiking trails and understand a little more about the park. Before I knew it, the others have arrived and we were ready to start adventuring! Thing to note, it was -32 degrees and was feeling well below -40, but that certainly did not stop us. We were all excited because the light was particularly beautiful, with the sun that was starting to set. For those who have never been to this park, it's located in a valley between two beautiful mountain ranges so the light does not last as long, but still gives such a stunning presence. I was feeling a bit overwhelmed with my anxiety and depression, and decided to take the catski shuttle half way to the black ice, and walk the 4km back enjoying the last hour of sunlight alone as others chose to go all the way to the Equerre station which was about 8km and adventure back on fat bikes. Arriving to my stop, there was a cozy lodge with a fire where we can warm up before heading out. I actually was so impressed by the view that I head straight for the frozen river where I was greeted by the stunning black ice that covered the ground. The black ice phenomenon, is when the river freezes up so clear that you can see straight through. It’s kind of sketchy at first cause you feel like you can fall right through, but the park director mentioned that it was also about 4ft thick and that it was totally safe. I hung out there for a good hour having so much fun photographing this wild nature phenomenon. My hair and face were frozen, and in the space of an hour my camera was almost dead. I decided to start walking back before I loose all my batteries. Oops. I forgot to pack my other batteries with me… But no worries I had plenty of juice left. Walking alone was definitely soothing. I just walked, looked around, stopped to enjoy the scenery and sometimes sat on the ice to cry a little. (Trying to be totally transparent with you all. Dealing with depression is extremely difficult, especially when you are out on a contract.) It felt good to feel the benefits of what being surrounded by nature, without technology (a part from my camera of course). It was surely very cold, but honestly, being well dressed and a little zoned out on the scenery, I did not feel much of the cold. After getting back to my car, I felt better. It was like if nature just came, took away some of the weight off my chest and gave me a push to keep up. I headed to my cabin, where I got to experience the new Echo Cabins for the first time. They are a lot larger than the EXP and Nature cabins, offering a nice lounge area to relax. I felt totally immersed in the mountains, not seeing any humans around. I started a fire, made dinner and relaxed as I read a book and listened to a few podcasts. After having a week of sleepless nights, I was happy to say that I easily passed out around 8pm and woke up the next morning fully recharged. I was super stoked hahahahah! The following morning was very grey and ‘‘dull’’. However it was a bit warmer, we were greeted with a -25 instead of a frigid -30 which definitely felt better. I arrived to the Draveur and talked to the shuttle driver who showed me a few moose videos he took this morning. I was in awe as to the fact that I still never saw a wild moose yet. I was originally supposed to go on a hike with a friend, but decided to take my chances and go up to the Equerre station with the shuttle driver in hopes to retrace the moose he saw earlier in the morning. I was crossing my fingers the whole time, and was keeping my eyes peeled. The driver, who was incredibly kind and passionate about his work showed me the fresh tracks and where the moose where heading and then all of a sudden we saw not one, not two but THREE in the woods. I jumped out of the catski before it even came to a halt and just jetted towards them, being respectful of course. They were about 40 ft away, and I slowly made my way through the chest deep snow (what an adventure that was!) as I got to about 20 feet from them. I watched them, managed to capture a couple of shots of them before they ventured further into the forest. What a spectacular moment. It truly made my whole week, if not my whole month. Seeing moose out in the wild like this is a completely insane experience. They are massive animals and truly majestic. We made it to the station, where I was exhausted from the adrenaline of seeing animals… Duh! HAHAHA! And hung out with the driver at the view point watching the scenery around me. It was cold and we moved into the small tent where there was a cozy fire. I watched the little mouse scurry around thinking on how good that mouse scored on his new warm home for the winter. Before you knew it, it was time to head back to the main lodge, where I had lunch with everyone and hung out a bit. I was quite tired and it was the end of an incredible adventure. During the winter season, we have a tendency to stay inside and complain about the weather. But taking the time to be well dressed and adventure outside makes you realize how beautiful winter truly is, especially in Quebec. We are so lucky to live in an area where we can experience all four seasons and having the opportunity to document a park in the dead of winter was surely an experience I will never forget. Everything is different in the winter, from the light, to the activities, to the weather, and it’s cool to be able to explore and to understand more about our local regions. Big thanks to SEPAQ for inviting me on this trip, it was truly an honor and hopefully will be able to take part in another media trip in the near future. What a beautiful province we live in!